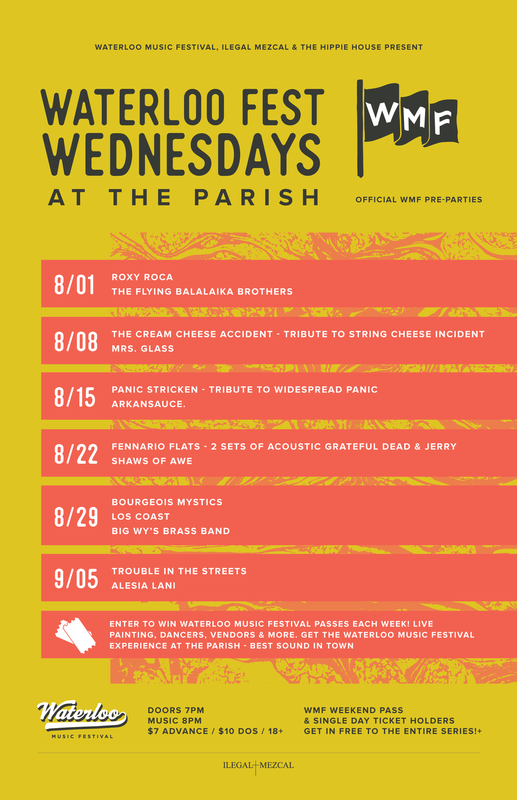 Waterloo Music Festival, Ilegal Mezcal & The Hippie House present Waterloo Fest Wednesdays at Parish! We couldn't wait until September, so we decided to start the celebration early. Come out to the official pre-parties and get the festival juices flowing. We'll be there every Wednesday beginning August 1st until we meet you at Carson Creek Ranch for the festival September 7-9! Join us for live painting, vendors and more from The Hippie House, delicious Mezcal cocktails from Ilegal Mezcal and performances from some of our absolute favorite Austin artists. Get to know amazing local musicians, and maybe even win tickets to the festival - Each week we'll be giving away a pair of Waterloo Fest GA passes to a lucky winner. Tickets are $7 Advance, $10 at the door, or free with with your WMF weekend or Single Day pass. The events are 18+. A $5 minor surcharge will be collected at the door for those under 21. Already have your WMF weekend pass or a single day ticket? You get in free to the entire series! Kickoff Waterloo Fest Wednesdays with us at the first event August 1, featuring ROXY ROCA & Flying Balalaika Brothers! See you soon.